Turn your PDFs into Word documents you can edit. PDF 2 Word converts PDF files into Microsoft Word documents. PDF 2 Word preserves the text, layout and images of your original document. PDF 2 Word instantly converts PDF files into Microsoft Word documents that look just like the original - complete with all formatting and images! Information is set free - free to be edited and free to be integrated into your documents. PDF to Word Conversion task can be a way easier than you thought. Download a free trial and evaluate it yourself. Moreover, we are so sure that PDF to MS Word makes you life easier, that we provide an unconditional 30-days money back guarantee! Just try it, if you won’t like it – we’ll refund you money. 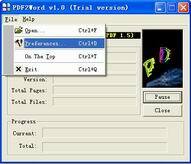 PDF 2 Word software is a standalone program and does not require Microsoft Word, Adobe Acrobat, or even Acrobat Reader. VeryPDF PDF to Word Converter gives you an opportunity to download software to edit PDF file in Word that will let you write annotations, delete the words, change the order of pages and any other types of modifications. PDF to MS Word conversion software enables to export text, images and other content from PDF files by preserving the original layout. If you are searching for the advanced solutions to convert from PDF to Doc, software products by VeryPDF will help you significantly save the time spent retyping, retrieving and reformatting PDF files. Whether you need to modify the files or view PDF in Word, PDF to Word Converter is easy to use, yet powerful program to work with PDF documents within your workflow. PDF 2 Word is a batch PDF Converter that you can convert a lot of PDF files to word documents once time! saving your time! Our PDF to MS Word conversion software is designed to convert your data with a minimum loss of the formatting information presenting layout and graphics. The program not just edits a PDF file in Word, it also extracts paragraph alignment information, converts images and most of PDF drawing primitives and has very easy-to-use wizard-style interface. PDF 2 Word is a standalone software, MS Word, Adobe Acrobat and Reader NOT required!